Your peaceful getaway begins at River View Cabin- a horse friendly cabin! River View Ranch Cabin vacation rental is a quaint Ranch nestled between the Shenandoah River and the Massaunutten Mountains. It is situated on almost 5 fenced in acres with a barn. The log cabin style interior creates a warm, cozy atmosphere for its guests. It features a spacey, fully equipped country kitchen with plenty of natural light, living room with a wood burning stove, 2 bedrooms (queen & full sized beds), 1 full bathroom with a beautifully tiled walk-in shower, rear deck with mountain views, as well as, a covered porch with a hot tub. Warm knotty pine wood flooring is throughout the entire cabin. Central heat and air conditioning are included to make your stay more comfortable. Outdoor fire-pit out-back; Perfect for gathering around and roasting marshmallows under the stars! 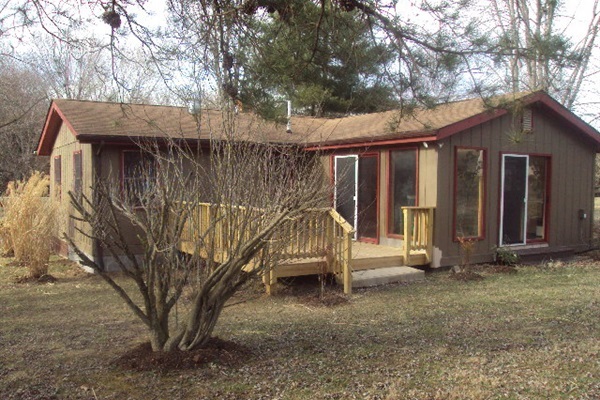 This cabin is within walking distance to the Shenandoah River, our private community access spot with picnic area & boat landing, and one mile from a public boat landing. The Shenandoah River Outfitters is only minutes away by car, as well as, to hiking trails in the George Washington National Forest. Bring your fishing poles, inner-tubes, bicycles, and hiking shoes. Of course… it is horse friendly… Bring your horse and ride the local trails! Horse fee: $20/night per horse.